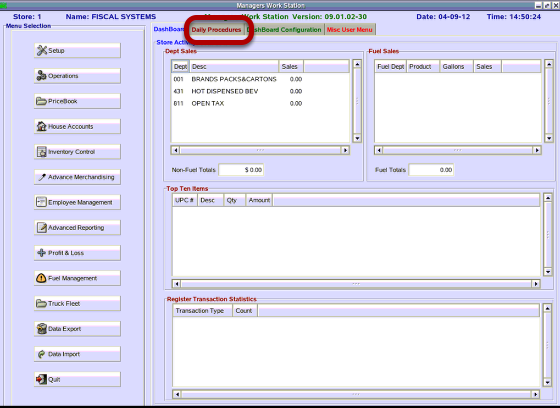 TravStar1 Point Of Sale SystemManager's Work Station Daily ProceduresHow Do I Close the Day on the Manager's Work Station? How Do I Close the Day on the Manager's Work Station? This lesson will summarize the End of Day Process for the Manager's Work Station. From the Main Menu, click on the Daily Procedures tab. 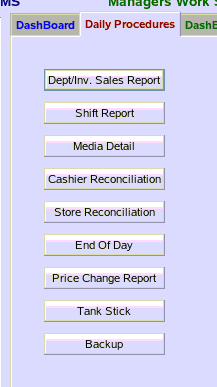 The Daily Procedures screen is basically a suggested “To-Do” list for the store manager’s convenience. The items displayed are in a sequential order of tasks that are recommended to be completed daily by the store manager. Each of the buttons is actually a shortcut to procedures that belong to individual modules on the MWS. How Do I Run A Department And Inventory Sales Report? How Do I Run A Shift Report? How Do I Run The Media Detail Report? How Do I Declare Cashier Tills? How Do I Run The Store Reconciliation? How Do I Run An End Of Day On The Manager's Work Station? How Do I Backup My Manager's Work Station? How Do I Run A Red Flag Report? How Do I Run A E-Journal Report? Prev: How Do I Change the Manager's Override Code? Next: How Do I Run a Department and Inventory Sales Report?